I’ve noticed that 62% of my blog traffic actually still comes from people visiting this site instead of my new blog at http://uniquefrequency.com, so I thought I’d post a link here to direct you to what I think is a pretty important post: blog coverage of Social Media Breakfast: Singapore 2. If you couldn’t be there, why not check out what it’s like by reading/watching our experiences? I’ve moved to http://uniquefrequency.com from tonight. I’m still working out the kinks (many of them) so bear with me while I refrain from updating over the long weekend, and hopefully I’ll be back in business from Tuesday or Wednesday. The rss feed of the new site is http://feeds.feedburner.com/uniquefrequency so it would be great if I could trouble you to exercise 2 clicks and update that on your feed reader. If you don’t know how, here’s a friendly little guide. I should’ve made the switch earlier and everything, but was just held back by a crazy schedule and a bit of inertia, but it’s reached the stage where the incoming linkjuice is too good, and time to move on to a permanent blog before the opportunity cost grows. I’ll definitely look back fondly on this blog as my first foray into serious blogging and the great people who I’ve discovered or discovered me via the blog, and hope we’ll all maintain that community at the new site. Thanks for sticking with me through this blog (un-skinned and all). If you know anyone who does killer skins and/or themes, let me know? Thanks. I was at an informal meeting today which I quite enjoyed. We had bloggers, client-side people, agency-side people, all of whom were interested in social media. I thought the discussion was generally good, but one question in particular stood out. Someone mentioned that if hotels wanted to blog, why not get the concierge desk to blog as the stories of what goes on on the ground as well as useful information about the city would be useful and relevant to travelers visiting the hotel or deciding where to stay. It was raised that there could be a number of authors running the blog or just one person, but they should be anonymous. Perhaps blogging as “Your friendly concierge at the Hyatt”, for example. Bill and Coleman called him out on this and said companies who blog should have full transparency and name their bloggers. But the very reasonable reason of “one day they’ll leave” surfaced, and I’m having a hard time reconciling the two. On one hand I am a transparency advocate. There are times when anonymity helps (ie when needing to talk about a sensitive issue), but generally for an external blog, I think the public should know who is the person blogging. But I think the person leaving is a real concern. Take Matt Cutts for example, arguably Google’s “face” on the internet. If for some reason he jumps ship to Yahoo! tomorrow, would that be a problem? Thousands of readers may just migrate over. And who would take over that role at Microsoft and Google? How long would it take the new person to re-build a community? Of course, I know, Matt Cutts is hardly the best analogy for concierge staff, but you get the gist. So what would you do if you had to hire a community manager or social media evangelist? Would you be comfortable with them being your company’s Web2.0 “face” online? Would it worry you if they moved on? Would you be confident of replacing them with little to no loss in interest from the community? You might remember my “Why Students Should Blog” post in response to HackCollege’s contest. I finally caught up with episode 26 of the Hack College Podcast today by Chris and Kelly, and was thrilled to find that I made the final four to win a Hack College t-shirt! The segment starts at about 18 minutes and I think the collection of answers are really good. I appear in the episode as a tweet. I know people go on about how social media and blogging and whatnot in North America doesn’t always apply here, but this one does. If you want to discover more, check out “The Case For Student Blogging” by HackCollege, I think it’s pretty good stuff. If you’ve been agonising over the perfect phrasing of your resume since forever, why not take a look at this and find a better way to supplement your case for future employment. By the way, need more case studies on Blogging Yielding Fruit? Look no further than my Social Media Breakfast co-hoster Derrick Kwa who scored one with the one and only Seth Godin, as well as Corvida aka Shegeeks who scored one at ReadWriteWeb. It’s happening people. Stop ignoring it. Remember why students should blog? Well I’m happy to announce that the third internship worked out and I start on Wednesday. Exact details won’t be posted because of confidentiality issues, but suffice to say it’s social media related. To me the biggest value is to be thrown into the “real world” and see if the stuff I’ve been blogging about makes sense, or am I living in this dream from the outside looking in. Could be a harsh slap of reality, but better now than later. The downside is that it’s only six weeks (because I’ve committed the whole of July and half of August to my previous employer, MTV to work on the MTV Asia Awards held in Malaysia. That is going to be a blast! However, rest assured the blogging here will not be changed in anyway. I definitely won’t be blogging about work unless given express permission, and if I do, it will be fully disclosed. I might end up blogging less than normal because of work hours, but that’s what RSS is for! (Don’t know how to subscribe, here’s my handy guide). But as I sat down to start writing tonight, I realised there’s a bigger question here: Why, out of the many, many links sent to me and blog posts that I read a day, did I want to particularly highlight Pat’s? Someone who I have never talked to online or in person? Of course because it’s relevant and well-written, but there’s something else. This is the second direct message she sent me, the first was even more targeted, saying something like “for the social media junkie” followed by the URL. helps companies understand, as well as anticipate, the needs of current and potential customers. Isn’t that exactly what happened here? Unlike the mass tweets about a “new blog post” (which I don’t mind at all), this really makes me sit up and take notice, because I know it’s a careful, considered move to bring the level of interaction one step closer (from general tweets to a direct message). And the reason why that step would be taken is because she knows that that post would be particularly relevant to me. “So what” you say? Well, what if you could do that for your customers? Companies are obsessed about CRM, about data, interactions, trends and the like. And here they are in front of you. What if you knew Person A particularly likes a biscuit flavour that you happen to be bringing in? A personal email with an invite to be the first to taste it? Or an ad in the newspaper in hopes the general population will pick up on it and drop by? It’s a lot of work, no doubt about it. But hey, people pay money for CRM software and hotels notice how guests shift their furniture so that they can do it for them for future visits. Is this really too much? Especially in Singapore? How Would You Help Lucky Charms? 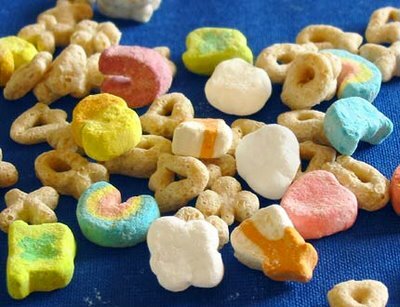 I know there is a percentage of the population who misses Lucky Charms. That cereal with the marshmallows in the shape of four leaf clovers and horseshoes and stuff like that. I know that because when we were in New York over the December holidays, a group of us consumed it like it wasn’t from this earth. I don’t know why, but the cereal mysteriously disappeared years ago, never to be seen again. I don’t know about you, but Froot Loops took the place of my favourite cereal. Guess I just like some colour in my cereal. Interestingly, my girlfriend e-mailed the major retailers in Singapore and couldn’t find the reason why it was stopped, but confirmed the fact that none of them were bringing it in. Jason’s Marketplace at Raffles City is apparently bringing it in, as well as a whole line of cereal from the same brand. So the question is twofold: What would you do if you were the agency tasked to bring Lucky Charms in and generate some sales? After all, unless you’re looking out for it, it would be just one of the 34,632 other cereal boxes on the shelves. And from the other side of the coin, what would you do if you were a consumer wanting your sorely-missed Lucky Charms to reach the shores of Singapore again? Remember, it’s not about whether it would work, it’s about how you’d use social media from either side of the fence. Or maybe… you wouldn’t use social media at all? The attendee list on the Facebook Event page for Social Media Breakfast: Singapore 2 has been at 40 people for a couple of days now, about 60% were present at the first one. This is good in the sense that we’ll be familiar with each other and really move the conversation forward and talk about the crazy issues that plague all of us who’re trying to figure out the space. , and if we want the landscape of social media to change, we have to reach out. To people who are just entering the social media domain, to people who are curious but still on the fence, to people who don’t even know about this world yet! So here’s the challenge: Convince one other person (friend, classmate, colleague, family) that this is worth their while. Let them know it’s newbie friendly, after all, most of us are new to the space anyway! That’s the mission if you choose to accept it, come back and let everyone know how it went by posting in the comments section! Listening to Marketing Over Coffee on the way home, there was a very small section talking about GoogleDocs and how you can activate a form to collect data for you. It also made me think further on the question about how much we’re collaborating (or not collaborating) online. We had to create a wiki for our social media class, and of course, wikis tell you how much (or little) someone edited the final output. It was noted that a handful of people contributed the majority of the content, which made our Professor, Michael Netzley, less than thrilled. I brought up the point that though a few people may have been the actual ones to enter the text, doesn’t mean the whole team did not collaborate together. Both sides are debatable, but that’s not the point. I’m an assistant scout leader for my alma mater’s scout troop and every year around this time we have a camp. As with previous years, the emails pile up, meeting minutes get distributed, camp schedules get sent and changed and re-sent and re-changed until eventually, no one knows what in the world is going on anymore. To solve this, I set up a wiki for the leaders. It’s a private wiki so I’m sorry I can’t share the link. I will however say that we’re using PBwiki, which I find to be superior to Wetpaint in terms of editing as well as help. But that aside, so far it’s been helping us keep track of personnel and manpower, topics of discussion, a couple of things to be noted, schedules, equipment lists and so on. No more losing of minutes on paper, no more “can you send me the latest schedule? I can’t find it”. Everything is up there and updated. To the minute. So why aren’t more of us doing this? Is it the challenge of working alone as Michael brings up? Or an unwillingness to change our styles of working? Does it make sense for us to share our items on Google Reader (my shared items are here)? Or on del.icio.us? How about collaborating on Google Docs in the classroom? In the office? To me the biggest problem is convincing the people you’re working with that it’s worth their while. In my scout case study, I knew the people who were primarily going to enter the data would be the younger adult leaders, while the older leaders would keep and eye on it from time to time. To both of these groups, you gotta speak their language. To my peers, it was the idea of collaboration. To see everything in one place, to have links and for easy reading. To the senior leaders, it was the idea of streamlining information. Not losing paper, not having to distinguish whether schedule(final).doc is the true schedule or schedule(final)THISISTHEREALFINAL.doc is the true schedule. So how’s collaboration working (or not working) for you? Are you using wikis regularly? Online document processors or software based? Is it a challenge convincing your classmates/colleagues to use it as well? Without doubt the podcast of the month for April goes to For Immediate Release which I usually have problems keeping up with (it’s released twice a week, one hour each), but the content for April was excellent and I found myself listening to it first among my podcasts. Live call in show #5 highlights: How should companies reach out in social media without offending the people in it? Great analogy of standing at a party table and interjecting about insurance while they’re talking about something else. #339 highlights: Dan York & Sallie Goetsch take over. Lots of Twitter news and I have a comment left via Twitter! I have to say, hands down, if you’re doing anything in the digital/social media space, you need to be listening to this podcast. Managing the Gray – Manic Mummies episode, great case study on GM and how to do sponsorship in social media. Marketing Over Coffee – “Captcha and Turk“, lots of stuff on startups as well as a whole slew of WordPress plugins I never knew about. Shill #6 meandered a little this month, but still a worthwhile discussion about whether there’s any value in re-posting news. Six Pixels Of Separation #98 (interview with Collin Douma), #99 (very interesting, almost counter-intuitive information regarding online reviews) and #100 (long conversation between Mitch, Brian Eisenberg and Avinash Kaushik). Did you listen to any of these podcasts? Are you listening to different podcasts? I’m always on the lookout for great social media related podcasts, recommendations always welcome.